Racketts are the logical (absurd?) extrapolation of bassoons and kortholts. The Renaissance rackett has nine parallel cylindrical bores passing through a single piece of wood or ivory, joined at the top and bottom by the end caps. Fingerholes are drilled through the body to intersect the various bores at the appropriate place. My racketts (made by Keith Loraine, who also makes a great bass shawm) have 11 fingerholes, including both thumbs and two holes covered by the middle joints of the index fingers: only the left little finger doesn't close a hole. They play about 1.5 octaves in fundamentals, and can be overblown for higher pitches. The rackett is also a double reed instrument, typically equipped with a reed resembling a short contra reed. Due to the way the bore is folded (and the acoustic properties of cylindrical bores - ever wonder why a clarinet can go nearly an octave lower than an oboe of the same size? ), one gets an astonishingly low pitch out of a very small instrument. My contra (great bass) rackett is 10" tall (14" including the reed and pirouette), and plays in the contrabassoon range. A quick sample? Here's the lowest C in WAV or mp3 format (about 38K). 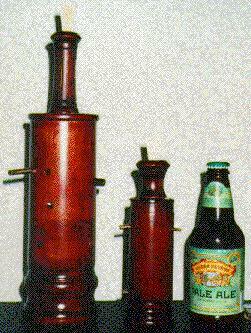 The "alto/tenor" size covers the lower end of the bassoon range, and is about the size of a beer bottle (6" for the body, about 8" with the reed and pirouette). Here's a few notes (literally) on the alto/tenor in WAV and mp3 format (about 115K and 128K, respectively). A picture of the instruments in question, along with a favorite beverage for scale. Racketts flourished mainly during the Renaissance. A version was made in the Baroque (I think by Denner) which however used a conical (bassoon-like) bore instead of a cylindrical bore. It sounds much like a bassoon or dulcian/curtal (as opposed to the Renaissance rackett, which sounds more like a giant crumhorn). If you're given to perusing early music catalogs, you may see it referred to as a "pocket bassoon", or "sausage bassoon." Copyright ©1995-2000 by Grant D. Green.